winOHS is the perfect tool to complement your Safety Management Plan; having established your methodologies for incident reporting, hazard identification, safety inspections, training and so forth, winOHS is the tool to record, organise, and manage all the information associated with these obligations. winOHS enables you to output all this information for meaningful reporting, analysis, control and follow up. winOHS comes fully integrated with all of the functionality & features of winHR, this takes winOHS a step beyond most other WHS/OHS software products where a lot of critical HR Information isn’t available. HR information often overlaps into OHS/WHS, as for example when an employee is involved in an incident, information about their position, age and pay rates at the time of an injury, as well as training, permits, licences and Inductions, leave history and more, are all retained in the same system and does not need to be looked up in other systems or data bases. 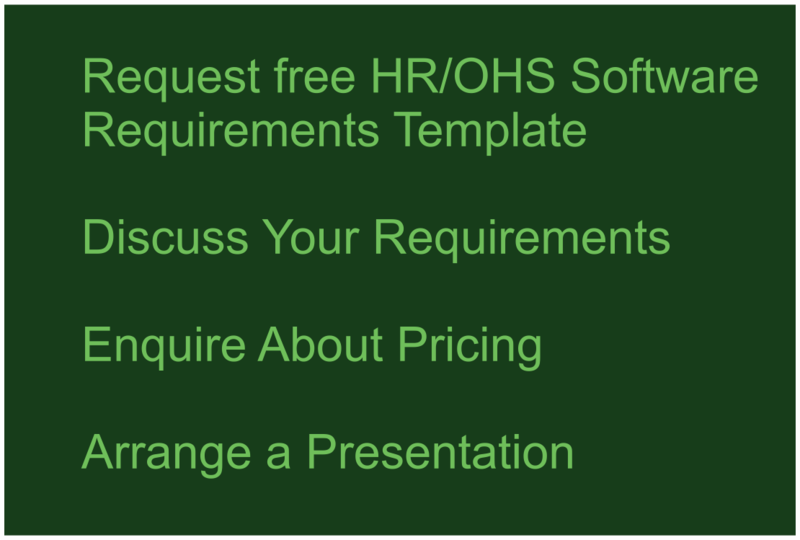 Importantly, you are able to switch off the HR components that you do not require. A functional grid layout where all your predefined hazardous activities and events are recorded along with the associated risk treatments to manage the risk. The grid layout design allows you to quickly search, sort, and view entries and easily update your register with new activity risks and action treatments as well as apply additional risk treatments to existing activity risks. Importantly, when incidents occur or hazards are identified, you are able to link these to the relevant underlying activity recorded in the risk register. This provides an effective way to measure the strength of your risk treatments for each activity. Because you are able to identify risks which have resulted in incidents you are able to apply additional safe guards and risk treatments based on root cause analysis of the incident. When additional risk treatments are applied against the risk your risk register report is updated with the additional risk management actions. Typical outcomes, improvements & benefits you can expect. Manage your incidents and hazards from the same grid. The recording fields are customised to match your existing incident and hazard reporting forms, making transition from manual data entry to data base entry easy and familiar to system users. Managers are then able to Create actions against the logged event and assign them to those responsible for carrying out the actions. Email alerts & reporting keep you informed of the occurrence, progress, and status of the event. The incident management functionality allows you to manage incidents from the initial recording of the occurrence through to Corrective Actions, Return to Work, People Involved, Affected Body Parts, and Compensation Claims right through to Close Out. You are able to link incidents back to their underlying risk in the Risk Register, thereby providing you with useful insights into the measures you need to take to improve your existing risk treatment around activities and events. With the ability to link Incidents and hazards to your organisational structure and areas you are able to identify the exact areas and locations of your operation where safety issues may represent a concern. A powerful suite of 4 types of reporting tools (Smart Grids, ReportViewer, GraphViewer, & ReportBuilder) each suited to a particular mode of reporting, will keep you abreast and informed of safety statistics, with Lag & Lead reports, safety trends, overdue actions and much more. Click here for some examples of the many types of reports available. Typical outcomes, improvements and benefits you can expect. In some respects, carrying out a safety inspection and identifying non conformance issues is perhaps the easiest part of the process, the difficult part can be following up on the issues. Without a system where reminders can be generated and reports quickly show the status of corrective actions arising out of Audits and Inspections, these items can be overlooked even when recorded. Unresolved audit issues can be disastrous so it is important to be able to keep on top of them. winOHS provides a very neat solution to the challenges of following up on these identified non conformance issues. Firstly, you still perform your safety audits and inspections as per normal, performing your walk-arounds with your checklists and noting any issues, but now you are able to also record a summary of the event in winOHS. Recording the date of the audit/inspection, who performed it, & the area audited. An audit number is assigned and a check box indicates if issues exist against the audit you are recording. All of the information is simply selected from drop downs, so the process is quite rapid. If desired, you are able to attach a scanned copy of the actual audit/inspection document. The second part of the process enables you to create and record issues arising out of specific audits/inspections. You are then able to create corrective actions against the relevant audit and assign the task to the person responsible. Email alerts are generated at various stages, for example; for further follow up email alerts can be generated for overdue actions. Using the reporting tools you are able to list all audits with associated outstanding actions. The ability to run these reports assists both the assigner and the assignee to better manage the whole process, and over-looking assigned actions will be a thing of the past. The ways in which you can report on these events is virtually unlimited. The screen shot below shows just one example where uncompleted corrective actions exist and to which audit and locations they belong. The system enables you to assign against each employee all the required training, inductions, competencies and so forth, based on the position held by the employee. 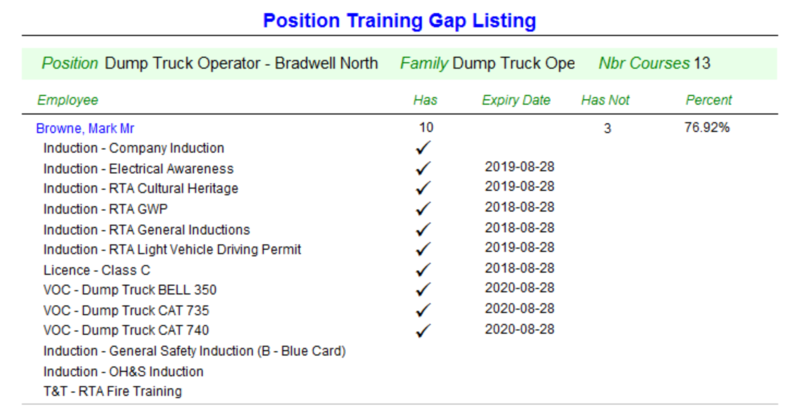 Because the system understands what training each employee has actually completed and what their respective positions require, a gap report is then able to be generated. Email alerts notify when items are due for renewal and a myriad of reports and reporting options are available to assist in the management of all training items, licenses, permits, and and any item which has an expiry and needs to be renewed or refreshed. Below is an example of just one of the scores of reports available. You have the ability to create an area structure to define all the major physical locations within your operation and including external locations such as client sites where you carry out activities. Having all your major physical areas set up in the data base allows the linking of events to these locations. Events such as Incidents, Hazards, Audits & Inspections can be easily linked by selecting the relevant area from a drop down. For each area of your operation you are able to record the total number of monthly (or other specified period you want to use) man hours and head counts active in those areas during the period. These data allow you to report on LTIFR and other common WHS/OHS LAG statistics.